Soldiers who march into battle carrying heavy loads do not usually perform well in combat. Their loads drain them of their strength, reduce their mobility, and slow their minds. The problem with overloaded soldiers in combat is a recognized deficiency throughout the Army, but the solution to the problem is less recognized and even less understood. All commanders must therefore develop an appreciation for the problem and then resolve to practice risk analysis instead of risk aversion when determining the load their soldiers will carry. Throughout history, soldiers have traveled into battle overloaded. Hardy Roman Legionnaires on the march carried 80-pound loads on long spiked stakes slung across their shoulders. Byzantine infantrymen found themselves with similar loads. Their ration carts and pack horses trailed behind them but did little to relieve their individual loads. During the American Revolution, from Boston to Saratoga. British soldiers fought their loads in addition to the American colonists. In the Normandy invasion of 1944, when American infantrymen with 80-pound rucksacks dropped from their landing craft into the rough surf off Omaha Beach, many of them never made it to the beach. Many soldiers fell into deep holes while wading in, and their already heavy equipment absorbed so much more weight in water that they could not get up. Others managed to crawl as far as the shoreline where they collapsed. There, overcome with exhaustion, many of them drowned. We attacked to secure the airhead. We were like slow moving turtles. My ruck weighed 120 pounds … There were all those guys sitting on the side of the road with IV tubes in them. There's no way the guys could [have gone on]. Professional soldiers and military historians over the past 30 years have addressed this issue at great length. In The Soldier's Load and the Mobility of a Nation, S.L.A. Marshall cites three fallacious beliefs that lead to overloading. The first of these fallacies is that large amounts of ammunition on a soldier's back gives him greater confidence in battle. Marshall contends that combat has never supported this myth, that soldiers will fight to the last round when necessary. The second fallacy is that shortages in ammunition cause "tactical disarrangements" and that such shortages are therefore to be avoided. But Marshall cites the defense of Bastogne during the Battle of the Bulge in which soldiers willingly shared their limited supplies to survive eight days of encirclement. The third fallacy holds that a soldier must be equipped for every possible contingency. Marshall blames staff officers for promoting this notion and argues that such thinking smothers and exhausts soldiers before they ever reach the battlefield. Certainly, the soldiers "sitting on the side of the road" in Grenada would have agreed. Among other studies on the subject, in 1962 the United States Army Combat Development Agency collected and analyzed statistics from World War II and Korea relating to the soldier's fighting load. The study concluded that the soldier's load had a direct effect on his performance in combat, that his mobility was "degraded to an unacceptable degree by his prescribed load." The agency further concluded that infantrymen, who represented 80 percent of all battle casualties in those wars, should be given special equipment and clothing to meet their unique combat requirements. The study recommended that the maximum fighting load be restricted to 40 pounds and that "officers at all echelons receive a thorough education and indoctrination in the problem of overloading the infantry combat soldier." Today, more than 20 years later, the Army is no closer to a solution. Officers at all echelons have not received a thorough education on the issue, and the US. soldier still carries too much weight on his back. Infantry units continue to practice worst-case planning instead of tailoring loads on the basis of an analysis of the risks. Although some people believe that advanced technology leads to lighter loads, it often has countervailing effects—it reduces the load only to increase it again later. The UH60 and the HMMWV (high-mobility, multipurpose wheeled vehicle). for example, are major logistical steps toward reducing the soldier's load. But other technological developments such as night vision devices, Vinsons, and Dragons put back the weight these logistical systems remove. Despite a doctrinal emphasis on "agility." the configuration of battalion and company trains does not support the concept of lightly loaded soldiers either. In fact, these trains rarely have space even for all the rucksacks of a platoon or all the chemical suits of a company. This implies that soldiers must carry all their equipment, regardless of when they expect to need it. Certainly, mechanized soldiers have an advantage, but even they have limitations. Peacetime training methods can also lead to overloading soldiers in combat. Units that put little emphasis on marksmanship, perhaps having their soldiers qualify only once or twice a year, indirectly reinforce the tendency to overload soldiers with ammunition in combat. These are the units that overlook the practice of "one shot, one kill," and in so doing prevent their soldiers from learning fire discipline and gaining confidence as marksmen. These units expect to defeat their enemy through volume of fire on the battlefield, and heavy volumes of fire require heavy loads of ammunition, loads that soldiers will have to carry. Similarly, units that evaluate live fires by noise and volume of fire also encourage heavy loads. The overzealous requirement to monitor the radio closely is another example. Typically, to meet their commander's requirements, soldiers duplicate their radio systems and carry extra batteries and accessories. To soldiers, then, the close monitoring of radios can mean heavier rucksacks. Training light should involve risk, just as fighting light involves risk. The attitude that "nothing is too good for the troops" must sometimes be ignored. Training light means going hungry because each soldier is carrying less food. It means braving the cold with one less sweater or trying to accomplish a task with less ammunition. Recognizing, of course, that hungry and cold soldiers may be in no better condition to fight than overloaded soldiers, the tendency to spoil them by giving them all they need and more may also lead to their demise. Commanders must realize that training with lighter loads may result in mistakes or in assessments that prove incorrect. But that kind of training allows soldiers to preserve their strength and to think faster than their enemies. The solution to lighter loads is risk analysis, in which a commander makes an accurate tactical assessment and calculates what is really needed for each mission. To do this. he must be willing to take reasonable risks. Assessing the risk requires an equation that leads to removing any unnecessary equipment from the soldier's load. Although the proper loading of soldiers is a concern of every echelon of command. the decision to remove certain items from a soldier's rucksack must be delegated to the lowest level of command. Still, a commander who decides. for example. that rucksacks and Kevlar helmets are not necessary for his immediate mission must have a way to get these items to his soldiers after their tasks in that mission are completed. Since no commander can dictate the conditions of his next battle, the value of a given piece of equipment will vary with each fight. A soldier is not likely to need all of his equipment for every battle. but each battle will most likely require different items of equipment. The battalion is the lowest level of command that is capable of deciding the soldier's load. because the battalion commander has the staff and equipment necessary to secure and transport the items the soldiers do not carry. Company commanders are restricted in their efforts to reduce the loads by the transport organically assigned to them and by the battalion assets dedicated tor their use. In most cases. the primary role of the company commander is to advise the battalion commander what he would like to leave behind and to request battalion support in transporting that equipment after the battle. Ideally, the battalion commander establishes a maximum soldier's load for the battalion on the basis of his analysis of mission, enemy, troops, terrain, and time (METT-T). (The US. Army Infantry School now recommends a maximum load of 30 to 40 percent of a soldier's body weight. For a soldier weighing 160 pounds, this would be 48 to 64 pounds.) Within that limit. his subordinate commanders then decide on the composition of their soldiers' load. In doing this. the subordinate commanders have four basic risk variables to work with: minimum essential equipment, climate protection, threat protection. and mission. Added together, these should weigh no more than the established maximum. 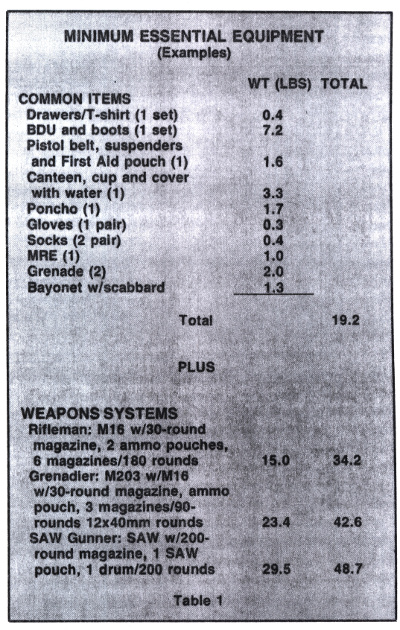 A soldier's minimum essential load includes his uniform, assigned weapon, and load carrying equipment (see Table 1). A minimum essential load is made up of the items a soldier always needs, regardless of his mission. These items are usually identified in a unit's standing operating procedures (SOP). Climate protection includes all the equipment designed to enable a soldier to operate in severe temperatures and rough terrain. 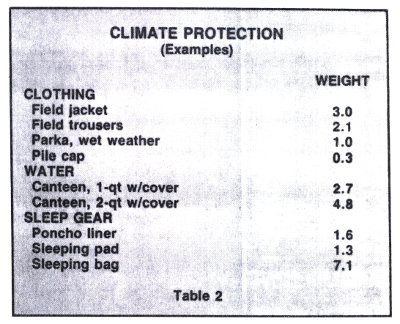 The wet-weather jacket and 120-foot rope are good examples (see Table 2 for others). Threat protection refers to equipment that guards the soldier against the expected ballistic. armor. and nuclear—biological-chemical threat. 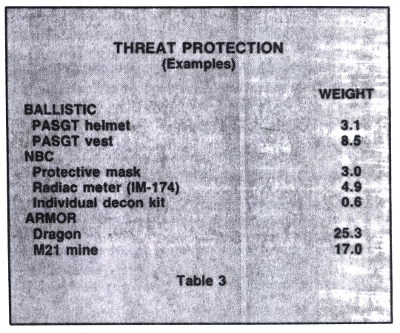 The Kevlar helmet and protective mask fall into this category (see Table 3). 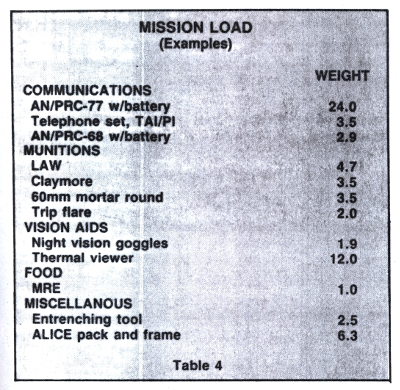 The mission load is made up of the munitions, food, and all the equipment required to accomplish the mission. Typically. this equipment includes ammunition, radios, and vision aids (see Table 4). After the minimum essential load has been accounted for items from the other three categories can be added, up to the established maximum. If, for example, the battalion commander determines that the mission requires a maximum load of 65 pounds per soldier, and if the minimum essential equipment for a rifleman, as stated in the unit SOP, weighs 40 pounds, the company commander has only 25 pounds to divide among the other three categories. His chore (along with his platoon leaders) is to determine the right combination of climate and threat protection as well as the mission load without exceeding the total weight limit of 65 pounds. It is helpful if units can conduct training designed to give subordinate commanders some practice in risk analysis. Members of the 82d Airborne Division have developed such exercises for platoon leaders. For example, in one such exercise each platoon leader is given load reference data and hypothetical METT-T data. His task is to analyze that data and load a certain soldier, using his company commander's guidance and staying within the maximum weight prescribed by the battalion commander. 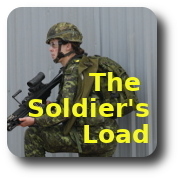 As part of the exercise, he must justify his decisions, state specifically what risks he is taking and why, and consider the effect that soldier's load will have, if any, on the load of the other members of the platoon. Risk analysis such as this demands an accurate assessment of the mission and its tactical environment. The risk equation forces commanders to take along only the most important items. It implies that the success of a mission depends upon agility and a proper balance of firepower and maneuver. It trades large amounts of equipment for lighter, quicker soldiers. Admittedly, risk analysis will not bring the proper balance of load and agility to certain types of infantrymen simply because of the equipment that goes with their jobs. Typically, the minimum essential equipment for a machinegunner is 56.2 pounds; a radio telephone operator, 58.2 pounds; an antitank crewman, between 59.4 and 64.6 pounds; and a mortar crewman, between 59.0 and 61.5 pounds. Their systems overload them, and risk analysis can provide little relief. The solution to this particular problem requires imaginative thinking on the part of commanders. It requires that portions of these soldiers' loads be distributed to other members of the unit—water, meals, and sleeping equipment, for example. These adjustments themselves are risk assessments, but failing to make them threatens the survivability of the men who must carry these heavy items. Strong legs and a good back are a soldier's most precious resources. They are the key to his success and survival on the battlefield. But putting a heavy load on those legs and that back robs him of his mobility and agility. It steals his strength and denies him the ability to think quickly. Today, the solution to the problem of heavy loads lies more with training than with technology. Training light means practicing risk analysis, not risk aversion. The risk analysis formula draws on the skill and competence of a soldier's leader. It lightens the soldier's load by placing the weight of the risk on his leader, and it is the leader who must make the decision.